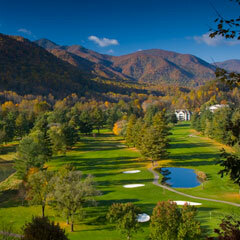 Nestled within the Great Smoky Mountains in Western North Carolina, Maggie Valley Club & Resort provides a secluded mountain retreat that is rich in history and offers upscale amenities. The centerpiece of the property is its 6,500-yard championship course, which offers panoramic views of the valley and mountain ridgelines. In addition, the club offers a myriad amenities and services including a full-service restaurant, fitness center, tennis courts, walking trails and heated swimming pool. The property includes approximately 40 condominiums available for vacation rentals and stay-and-play golf packages.